Science fiction movies are having a revival. With the current possibilities of CGI, filmmakers have the possibility to make supercool blockbusters with unequaled stunning visuals and more realistic effects than ever before. In “Blade Runner 2049”, director Dennis Villeneuve takes full advantage of these technologies and creates an outstanding cinematic experience. It’s more than just pretty pictures, though. At its core, “Blade Runner 2049” ponders the age old question of what it means to be human. In the near future dystopia, scientists have developed bio-engineered super humans, called Replicants, which have become the “working force” (read: slaves) of normal humans. After an unsuccessful revolution of the Replicants, the humans decided that all the remaining older Replicants should be hunted and “retired” (read: killed) by the newer, more obedient model of Replicants. K (Ryan Gosling) is one of these newer model cops, but what he discovers on his latest mission is something that could change the relationship and social hierarchy of humans and Replicants forever. Please, go watch this movie at the cinema. “Blade Runner 2049” was made for the big screen. You’re drawn into the movie as you watch K navigate his way through the hellish maze of Los Angeles and explore the post-apocalyptic outskirts. LA itself is unrecognizable: it looks like a hybrid of U.S., Russian and Japanese culture. The new vibe of the city is hostile and cold, it’s always rainy, and the ocean is kept out by a great wall. While this sounds anything but inviting, cinematographer Roger Deakins is determined to show the beauty of this world. He knows exactly how to use color and composition to bring out the most of every scene and create the biggest impact. Hans Zimmer’s music is a perfect fit. It is jarring and harsh, and Zimmer proves himself yet again to be a master composer. The cherry on top, however, is the fundamental themes that “Blade Runner 2049” addresses. Like in the original “Blade Runner” of 1982, the movie questions where humanity begins and ends. Where is technology and society heading? Can hope survive in such a desolate world? There is an endless amount of food for thought and you feel like you have just been through a whole semester of philosophy when the credits begin to role. Director Villeneuve really digs deep into the themes. He refuses to accept the easy answers, but explores them relentlessly. Furthermore, like “Black Mirror” (2011-2016), the topics seem to be unnervingly relevant to our modern day society and the answers are anything but happy. Many have criticized “Blade Runner 2049” as being slow-paced. But it is not a slowness that comes from a lack of relevant things happening. Rather, it is a deliberate slow pace that draws attention to specific aspects. I recommend this movie to everyone, whether sci-fi is your thing or not. Even if you don’t like sci-fi, chances are high that you will love it after seeing “Blade Runner 2049”. Plus, it has Ryan Gosling. And if you’re concerned because it is a sequel to Ridley Scott’s “Blade Runner”, which you might not have seen, don’t worry. Villeneuve’s “2049” can very well stand on its own and doesn’t require previous knowledge. 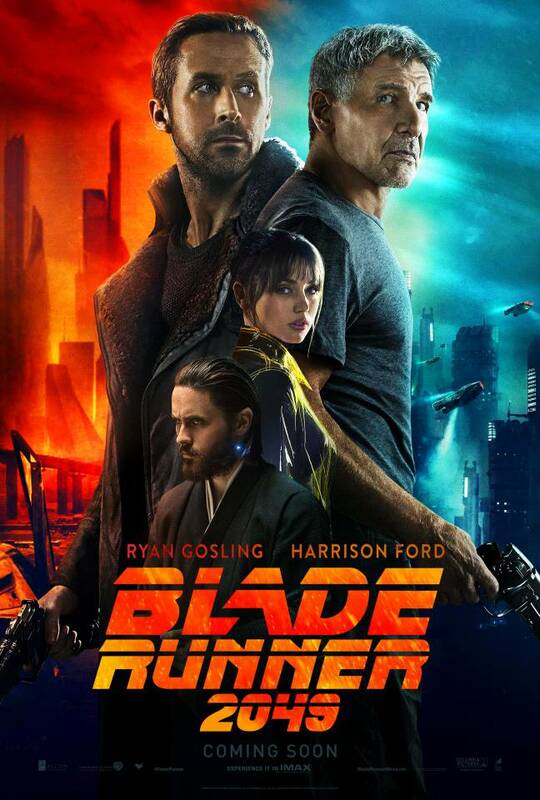 “Blade Runner 2049” is playing at Regal Fenway Cinema, AMC Loews, Somerville Theatre and a number of other cinemas in Boston. “Her” (Jonze, 2013): In a much nearer future a lonely man falls in love with his secretary. The problem is that she only exists as software and as a voice on his devices. Like “Blade Runner 2049”, this is a heart-wrenching story about the literal relationship between humans and technology. “Terminator 2” (Cameron, 1991): For a more action packed movie, go and watch cyborg Arnold Schwarzenegger travel back in time to try and save humanity from its doom and prevent a future very similar as in “Blade Runner 2049”, all while also fighting a newer model of cyborgs. Actually, you should see the first Terminator too, as both are really great movies! “Prometheus” (Scott, 2012): This is the first prequel to the “Alien” series, where a team of androids and scientists explore an alien planet and finds the remains of a long gone civilization. Soon they begin to realize that they might have gone too far, and even worse: they’re not able to turn back anymore.